Finallllyyyy it's here! My SLT one month review. I tried out an unlimited month membership and wanted to talk to you guys about how it went! It's long so get ready and make sure you have some time to dedicate to this post! These are the before and after photos. I want to make it clear that I'm flexing in the after photos. I didn't change my diet. 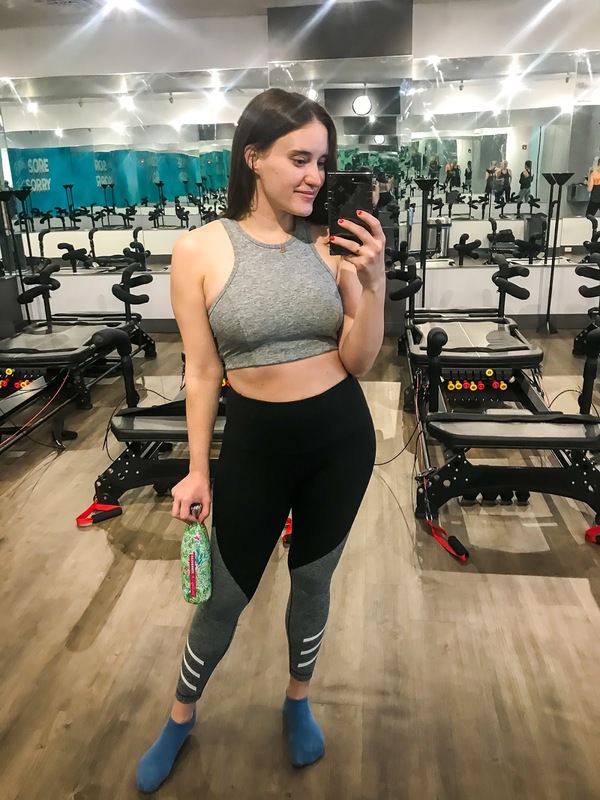 I was working out 5-6x a week (which is normal for my current routine) where a majority would be SLT and the rest included barre, yoga and a cardio dance class. To see my full routine, you can read this post here. I first heard of SLT through some friends who were prepping for their weddings last year. They talked about how it was the hardest class with the best results. I took a mental note and thought about it more and more while other friends talked about it or when I would notice locations in the city. You know how that happens -- where one person says something you've never heard about and then all of a sudden it's everywhere?? That was kind of what happened. 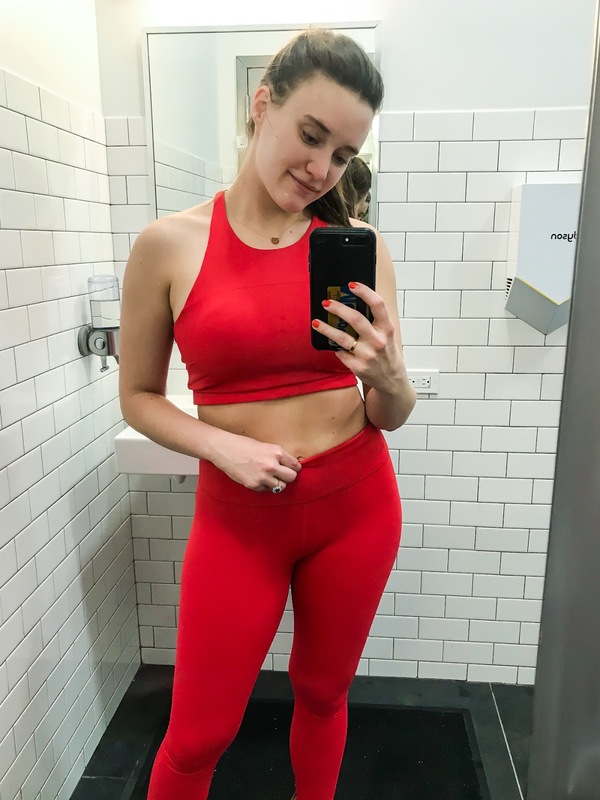 In January I was talking with Ashby about workout classes after she came to Barre3 with me and brought up how there are girls who always seem to have the best bodies who do a lot of pilates. You can see how the conversation unfolded in this vlog (at 3:00) but we decided to try a one month unlimited package at a studio in the city. Obviously SLT was at the top of my mind and I somehow managed to convince Ashby that the most expensive place would be the best to test out (lol). So we did it. We first signed up for an intro two-pack, which is basically two classes for the price of one. We made sure to sign up for beginners classes at two different studios to find out which location worked best for both of us. After that ended, we dove into the unlimited membership which is $400 a month. EEK! So crazy expensive, we fully acknowledge that. But if anyone is going to spend that much money to test something, wouldn't you rather it be us than you? To really make it worth your money you should go about 10x a month. A traditional 10-pack is $380 so why not do the unlimited package for an extra $20? It's how they get you! Our first class was good but so confusing. It was the first time we were doing a lot of these moves We were like, "how is this possible???" There were lots of moves where I didn't think I could do it and would just hold it instead of doing the full twist/legs back deal. After our first class Ashby and I both agreed that we didn't give it our all since we were making sure to preserve ourself for what would be to come. And we found we weren't sore the next day either. At our next class we would put more effort into it! We were not shy in telling our instructors that we were new. One, so they would take it easier on us, but also so they could help us really understand the moves. SLT is a good workout but it can be made easier by not doing the movements properly or going too fast throughout the class. It's SUCH a big difference when an instructor will come over and move your rib cage an inch or have you drop a hip over an inch. You're like "wowowowow that changes everything." It's not something you learn right away. It takes practice. You remember to tuck your tailbone or tip your ribcage up throughout different movements. You will find that you get better and stronger! If I'm remembering correctly it took about six classes to feel like I was getting the hang of it. I knew most of the moves. I had a general understanding of how I needed to do them and I didn't feel like a deer in headlights. I would say around class number eight I started to feel strong and around class 10 I started seeing some physical differences in my body. In all, I took 16 classes over the course of one month. That means I spent roughly $25 per class. Which is still a lot but in this city where most things are $30-35 it was pretty good! By the end I really felt good during the classes. I was strong, I knew what I was doing and even though I had gone so much for that month it was still challenging and hard. That's the thing about SLT. You're moving so slowly and really working muscles that don't see a lot of action. Classes are still really tough no matter how good of shape you're in or how long you've been doing it. The pain is an, "Oh gosh I think if I go another second I'll snap!" kind of pain but it really is mostly mental. I've never pushed my body this hard before -- especially my midsection. And it's not like you're worn out like you would be after lots of cardio. It's hard in the sense that I can't breathe because all of my oxygen and energy is going to my muscles to lift myself up. I don't even know if thats a good explanation. You just have to try it for yourself to understand! So you did a one-month trial -- What did you think? I kind of hate how good this class is. 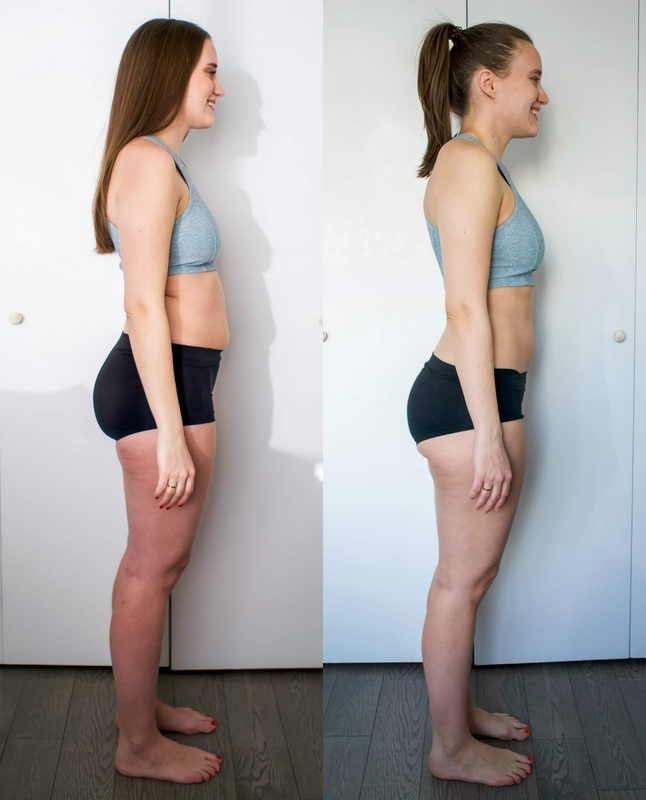 I really saw noticeable changes in my body and especially in my midsection (all the way around). I think it shows in the photos above. It really is a great class and an awesome workout but the obvious drawback is the price. It's so expensive that it's hard to justify even if the results are this good. Ashby and I have both tried other pilates classes since our membership expired and we've found they aren't really as challenging as SLT. They tend to be much slower paced, have lots of breaks in between moves, and progress faster through movements. I did one yesterday that claimed to be advanced and I just kind of yawned my way through it. There was a challenging move here or there but nothing compared to SLT. I didn't sign up for another month due to cost, but I did purchase a 10-pack (I know, I know) that I'm hoping will last me March and April. I will subsidize the SLT classes with my other go-to classes like Barre3, Y7 (hot yoga) and 305 (cardio dance class). Closer to the wedding I will sign up for another unlimited month and really focus on that until September. In terms of diet, I didn't change anything. Ashby did, and she saw some great results as you can see above!!! I'm just not at that point yet. I want to eat what I want when I want and not have to stress over food or feeling guilty. I eat pretty healthy most of the time but I could always be better. I'm not really looking to lose weight currently but rather just tone the body I already have. These are all reader questions that I will answer specifically about SLT and their NYC based classes. Remember since this is based off the Lagree method, there are other studios where you can get a similar workout and pricing will vary. I would Google your area and see what is available! I know SLT specifically has locations in Greenwich, Boston, Michigan, New Jersey, Philly and all over the New York area (18 locations!!). A: The one-month unlimited membership in New York City is $400. You can see other pricing breakdowns here. Q: Is it worth the price? A: As much as I hate to admit it, yes. If you go and really get your money's worth (especially with the unlimited) I believe it's worth it. Q: Will you continue to do the unlimited? A: I didn't renew after my first month but I plan on going back in July and doing it through the wedding in early September. In the meantime, I signed up for a 10-pack to hopefully last me March and April. Q: What made you keep going back? A: I was first motivated by a challenge I gave to myself to really see if this works. Then I was motivated by Ashby (and our classes together). Then it switched to being motivated to make the most of the cost and ended with being motivated by the results. Q: Is it as hard as it sounds? A: This is probably all relative but if you think reformer pilates or pilates in general is hard, then you will find this class challenging. There are modifications for everything but it is a difficult class! Q: Whats the biggest change you saw? A: The biggest difference is definitely in my core/midsection area. Q: How long before you started seeing changes? A: I think it was about six or ten classes in before I started to notice my body changing (in the mirror and on the machine in terms of the moves I could do). Q: What kind of workout is it? The Lagree Fitness Method is a high-intensity low impact workout that is adaptable to everybody. It's the perfect alternative to other high-intensity training options that can potentially damage the joints. Lagree Fitness effectively combines resistance, endurance, core, and cardio training to safely stimulate strength, flexibility, and balance. Q: How flexible do you need to be? A: This is again relative but you should be moderately flexible. There are lunge and squat movements that I would say require the most flexibility. I think, in comparison, you need to be more flexible in Barre and Yoga classes. A: No, there are only a certain number of megaformers (I think 8 or 10 in the location I go to) in the studio and no more people than that. So no, it's not crowded. Q: How should beginners approach the classes? A: I definitely suggest buying an intro 2-pack class (two classes for the price of one) and signing up for beginners classes. Thats what Ashby and I did to make sure we liked it but also to help learn about the machine and the moves. They are slower classes with mainly new people so you're in good hands! But just as a heads up, you wont start really knowing moves until about 10 classes in. Q: How hard is it to start/get the hang of? A: It's easy to start because you just do it. But I would say it takes about 10 or so classes to really get the hang of it. To know the moves, where you body placement should be and how to do the advanced versions of it all. Q: Do I have to be in good shape before starting? A: I think you should be somewhat coordinated or able to work out before going to this class. It's different for everyone, so I would contact your local studio if you're worried about it. Q: Did you change your diet at all? A: No, I don't believe in dieting and I didn't go into this trying to lose weight. Q: Can you do this on a lunch break? A: Yes, there are some classes where you sweat more than others, but can easily be done without looking gross afterwards. Q: How long are you sore after class? A: I was working out 5x a week before I started doing similar exercises so I wasn't ever really sore except for one class where I was a little sore on my side under my armpits and it only lasted one day. I've definitely felt more exhausted than sore after classes. Q: Do you have a favorite instructor? A: No, I really have liked everyone I've taken. I've taken a couple with Tracy (who I believe is the head instructor in NYC?) and she was H-A-R-D. At first I hated her but then I loved her. She'll really push you. If you're new, don't go to her haha! Q: What is the difference between this and Barre? A: The Barre studio I go to has much bigger movements on the floor using your body and some weights. SLT is more pilates-focused, so you're working on a machine that sets the resistance and the moves are much, much slower. Q: Would you recommend SLT or ClassPass? A: This would depend on what you want to get out of your workouts. 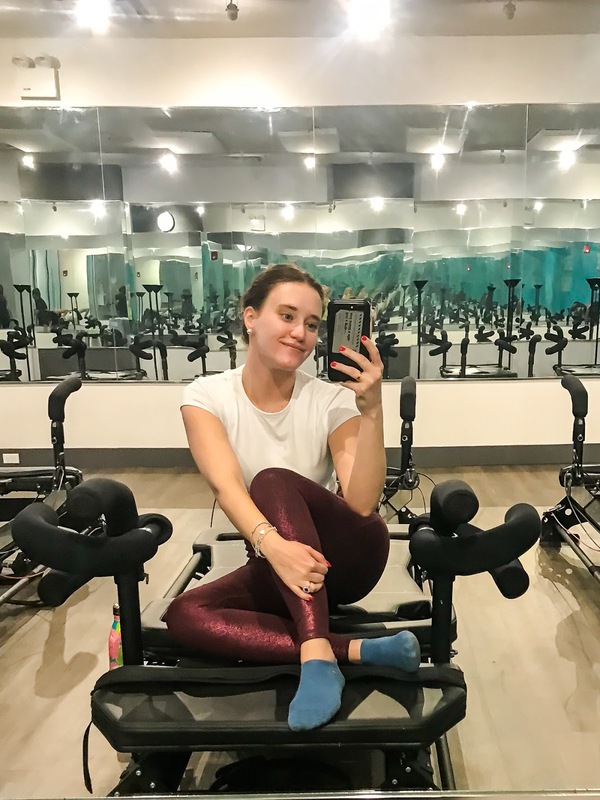 If you're looking for something more budget friendly and like to mix up your routine with different kinds of workouts or finding new classes, ClassPass is for you! If you have more budget to spend on classes and want a dedicated set of studios and don't mind doing the same kind of workout daily, then SLT (or any other single studio) is a great option for you. You look amazing! If only it wasn't so pricey! I have fallen off the workout bandwagon and definitely need to join a studio/buy some group classes to get motivated again! You look awesome! I go to solidcore through class pass (which I believe is very similar). I've been going to more yoga classes recently but you've inspired me to sign up for more pilates classes. Thanks for sharing, Krista! I've never tried a class at SLT but I've been going to Solidcore for about a year now once a week. I love it so much but the cost gets me everytime! I wish it were a little more affordable to I could go more often. It's such a good hard workout! GIRL! You look AMAZING. I've been dying to try SLT or Solidcore. The price gets to me since I do about 3-4 SoulCycle classes per week. But my sister goes to SLT, and she LOVES. Ahh I wish they had this in TX! Have you tried solidcore yet? I think they’re opening some ny studios. Very popular here in D.C..
You look amazing! Those results are incredible, even after just a month! I've never tried anything like SLT but I should see if there is a place in Boston!